April, and as the Earth’s north pole starts to swing towards the Sun, so we start to warm up in the northern hemisphere. Isn’t that amazing, that a celestial event can affect our everyday lives? Of course, it also means that we see the Sun for longer, so sunset is at half past eight by the end of the month. Venus is now swinging out from behind the Sun too, as it chases the Earth around our home star. It is visible now, as soon as the Sun has gone, over in the west. Because its orbit is inside ours, it never gets very high in the sky and doesn’t hang around too long before it sets. It is unmistakable though, being dazzlingly bright. Once thought to be Earth’s twin, we now know that the only thing they have in common is size. Venus is a strange, alien world. It’s so bright because it is shrouded in thick clouds, but not the lovely fluffy ones that fill our sky and water our gardens. Venus’ clouds are of sulphuric acid and they sit at the top of an atmosphere of dense carbon dioxide. This greenhouse gas has caused the surface temperature to rise to over four hundred degrees, hot enough to melt lead. It’s a very dense atmosphere too, making the pressure at ground level similar to being deep under the ocean here on Earth. Even its rotation is odd, turning on its axis more slowly than it orbits the Sun. This means it actually rotates backwards compared to us and sunrises are 117 Earth days apart. It has no magnetic field so your compass wouldn’t work there and it has no craters as any meteorite is crushed by that atmosphere before it reaches the ground. And you can see this weird sci-fi world every evening this month from your own bedroom – provided it faces west, that is. Look out for a thin crescent Moon close by on the 17th and 18th. 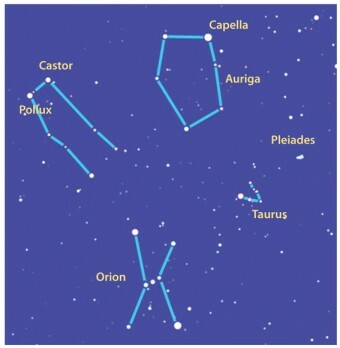 Elsewhere in the sky, the trio of the Pleiades, Taurus and Orion is starting to leave centre stage now, a sure sign that spring is on the way. Up above Orion, to the left, you can spot the double line of stars that make up Gemini, with the bright stars Castor and Pollux at their head. To the right is another really bright star, Capella, actually a pair of stars each about three times the size of our Sun, orbiting each other every 107 days with another pair of smaller stars orbiting them. This odd combination forms the brightest star in Auriga, a strange squashed pentangle of faint stars above Taurus. Look out for shooting stars from the 21st as Earth takes its annual Lyrid meteor shower. Also on this day, a Soyuz spacecraft is due to launch from Kazakhstan taking a new crew to the ISS. Check http://www.heavens-above.com to see if it’s visible, but look for the ISS anyway as it’s always an awe-inspiring sight.